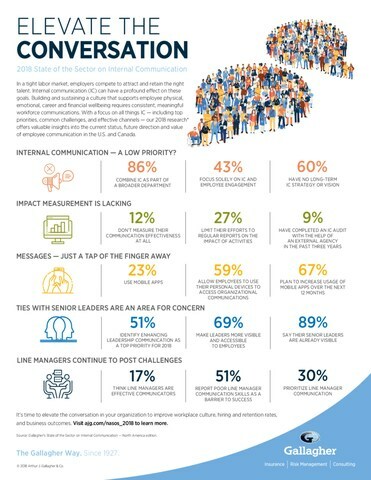 ROLLING MEADOWS, Ill., Aug. 28, 2018 /PRNewswire/ -- The most surprising finding in the Gallagher-published report 2018 State of the Sector on Internal Communication is how much less U.S. and Canadian companies prioritize internal communication, compared to companies in Europe and other parts of the world. Just 43% of respondents to this new survey of North American internal communicators are tasked solely with internal communication, compared to 57% globally. Results highlights from Gallagher's 2018 State of the Sector on Internal Communication comparing U.S. companies utilization of internal communications as a business driver to those in Europe and other parts of the world. "Companies risk being shortsighted if they view employee communication as a cost center rather than a revenue driver," said Leslie Lemenager, President, International Region of Gallagher's Employee Benefits Consulting and Brokerage. "High-quality internal communications can improve employee morale, engagement and wellbeing, which helps boost productivity and reduce turnover. And yet, internal communicators aren't doing enough today to measure their impact and demonstrate their return on investment (ROI) to leadership." Most respondents combine their internal communication responsibilities with other duties that usually involve external communication, public relations and marketing. For 86%, internal communication is part of a broader department such as corporate affairs, marketing or HR. Theoretically, this integration should ensure closer alignment between internal and external communication efforts, but more than half of respondents (51%) disagreed this is the case. Just one in 20 respondents indicated they are part of a dedicated internal communication and employee engagement team, about half of the global average. This is less than the 8% who indicated that responsibility for internal communication is scattered across a number of functions, possibly supporting the hypothesis that many North American organizations see internal communication as a secondary priority. Similar to global findings, North American internal communicators aren't prioritizing impact measurement. About one in eight respondents don't measure their communications in any way (12%), while another quarter (27%) do little more than report on their activity and its immediate impact. A lack of insight into results limits the ability to identify and apply better strategies for increasing employee engagement and wellbeing. 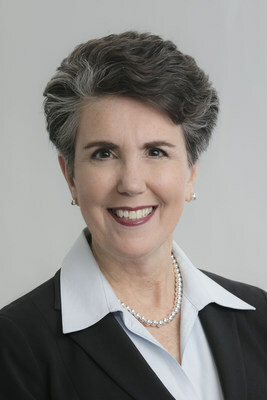 Among organizations that do measure impact, many use techniques that are relatively simplistic, output-based models such as online analytics and email statistics. Meanwhile, the opportunity to reap the benefits of rich, qualitative data are often overlooked. Just 9% have completed an internal communication audit with the help of an outside partner in the past three years. One positive sign is that two in five (40%) believe improving measurement and evaluation of internal communication activities is very important in the year ahead. "Not having a robust measurement process makes it very difficult to demonstrate the value created by an internal communication program," Lemenager said. "It's not enough to just measure activity. You really have to know how the activities – individually and collectively – are engaging employees at different organizational levels and supporting a stronger sense of total workforce wellbeing." Face-to-face channels are one of the better ways for employees to share direct feedback about what is – and is not – working for them. Yet, usage of face-to-face channels is very low. For example, while 89% of North American internal communicators see face-to-face events and calls as an effective feedback channel, only 38% measure impact this way. One bright spot for North American internal communicators is their rapid embrace of mobile channels compared to other countries. Even though just 23% of U.S. and Canadian companies use mobile apps, nearly three times that many (67%) intend to increase use over the next 12 months. Another stark contrast in mobile phone policies is evident from the 59% of North American organizations that allow employees to use their personal devices to access organizational communications, compared to just 38% of companies in the U.K. and 29% in continental Europe. "Employers have to adapt to the behaviors of their workforce, which is increasingly populated by younger workers who prefer to do everything on a mobile phone and tablet," explained Lemenager. "Developing customized apps requires an upfront investment of time and resources, but has significant potential to positively impact internal communication and employee engagement." The publication of the report follows Gallagher's recent acquisition of Gatehouse, a leading internal communication and employee engagement consultancy. Gatehouse has conducted State of the Sector research for the past decade to gain a better understanding of internal communication practices, channels and challenges. Now in its 10th year, the annual global study aggregates responses from over 650 internal communicators around the world, including more than 100 from the U.S. and Canada. This North America edition of the report offers unique insights into the current and future status of employee communications in the U.S. and Canada. Its purpose is to equip decision-makers with the knowledge and benchmarks they need to build world-class employee experiences.